Aaron Reed (DANM '11) and Jacob Garbe (DANM '13) launch Kickstarter for new interactive narrative, Ice-Bound! 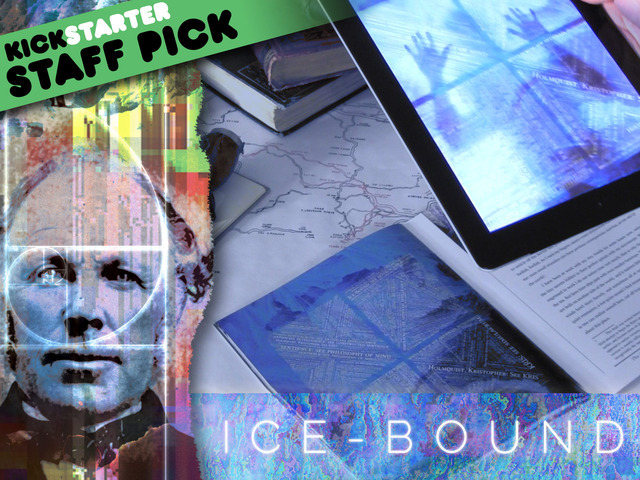 Aaron Reed (DANM '11) and Jacob Garbe (DANM '13) are extremely excited to announce the launch of a Kickstarter for their new interactive narrative, Ice-Bound! "This project has been a labor of love over the past fifteen months. It combines a printed art book with a digital game (either for iPad or a PC with webcam) to create a hybrid story about doomed polar explorers and a self-doubting AI. The Kickstarter is to help us afford a high-quality print run for the book portion of the project. Without a big budget (er, any budget) for advertising, we're really relying on word of mouth to help get the word out about Ice-Bound. So if you know anyone who likes weird, mysterious books, plays story-based computer games, or likes to hang out in mysterious icy labyrinths buried miles below the surface, we'd love it if you could let them know about the project. Any link-sharing you can do on your social media outlets of choice would be much appreciated, also. Thanks as always for your friendship. We are extremely happy and proud to let you know that a team of creators -- Aaron Reed and Jacob Garbe, both current PhD students in the UC Santa Cruz Center for Games and Playable Media and alumni of UCSC's Digital Arts and New Media MFA program -- was recognized for their game Ice-Bound: A Novel of Reconfiguration in the Best Story and World Design category for the Award at the 2014 IndieCade Festival. Judges said that Ice-Bound was "evocative of Jorge Luis Borges" as they selected it for this distinguished Prize. This rings true on more than one level -- both in the labyrinthine, nested tales that audiences uncover in playing Ice-Bound and in the reimagining of the form of the book and the structure of stories. In the story, a digital simulation of a long-dead author is created to finally complete his unfinished masterpiece. Players help this self-doubting AI explore a shifting space of stories filled with doomed polar explorers and fragments of his former self, in pursuit of the perfect ending to his life's work. This play includes using interactive story technology to project many possible versions of the story, dynamic conversation with the AI character, and using augmented reality technology to create interactions between the AI and a printed 80-page art book. The IndieCade awards are among the most significant in the world of independent games. Last year's winner in the Story & World Design category, Kentucky Route Zero, was one of the most successful independent games of the year. The foundational work on Ice-Bound was supported by CGPM's Student Project Incubator (SPIN) Studio program. Ice-Bound should be ready for release early next year. Meanwhile, Aaron and Jacob are in the midst of a Kickstarter campaign to fund the book printing process. You can pre-order your own copy of the Compendium by backing up their project at the level you feel most comfortable with. ©2016, Regents of the University of California. All rights reserved.